Registered Jerseys bring in more profit, dominate the Canadian Jersey market and are highly regarded globally. Selling an animal with proper identification and pedigree information gives buyers more confidence in their selection and increases the value of the animal. It also opens up A.I. incentives and export opportunities. Jersey Canada is the non-profit national association for owners and breeders of registered and recorded Jersey cattle. The association is responsible for the management of the Jersey herdbook, and its role is to provide tools to increase profitability and develop the Jersey breed in Canada. As gatekeepers of Jersey data and providers of multiple tools and programs, Jersey Canada helps breeders make good decisions. Can anyone register their Jersey animals? Although you don't have to be a Jersey Canada member to register your purebred Jerseys or record your percentage animals, our members receive discounts on registrations and transfers - plus there are numerous exclusive benefits and perks. The herdbook, often referred to as our pedigree database, is an on-line register where an animal’s permanent identification, its ancestry, date-of-birth, and ownership is recorded. It also includes breeding and progeny records, genetic markers, classification results and production data from milk recording services for registered cows. In Canada, the herdbook is governed by the Animal Pedigree Act, which supports breed improvement and protects individuals that raise and purchase animals. Accurate pedigree information is essential to the ongoing improvement of the breed. The Fresh Start Program is a special, once-in-a-lifetime initiative designed for owners of Jersey cattle who would like to begin or resume registering their animals. Exclusive one-time-only significant discounts are applied to registrations and transfers of ownership as a group of Jerseys is entered into the Canadian herdbook. To participate in the Fresh Start Program, complete the Fresh Start Program Application. Every animal must have a prefix. The prefix of the animal is that of the owner of the dam when she was bred. The full name of the animal can be a maximum of 30 characters, including spaces and suffixes (e.g. “ET” or “-P”). If the breeder of an animal does not have a registered herd name, the first owner’s herd name may be used. Breeders may choose not to have a registered herd name. The identification number and year letter may be used as a suffix for each animal. Where an animal is the result of an embryo transplant, the letters ET must be used as a suffix. Registration Certificates and Pedigrees shall indicate the level of purity, as a percentage. This percentage shall appear as part of the animal’s name. For on-line registration, click here. A password and established account are required to register your animals on-line. To receive a password, contact the Jersey Canada Registrar: info@jerseycanada.com or (519) 821-1020 (ext 101). Please allow one day for activation of password. For manual registration, download the Application for Registration and follow the instructions below. If you would like manual registration forms sent to you, please contact us. When using a manual (paper) registration form fill out the owner’s contact information at the top of the form. From the top left, enter the animal information as indicated in the example below. Continue this process for two additional animals in the remaining space on the form. Remember to sign and date the form indicating that all information is true. Embryo Transfer Check “Yes” if the calf is the result of an embryo transplant, “No” if he/she is the result of artificial insemination or natural breeding. 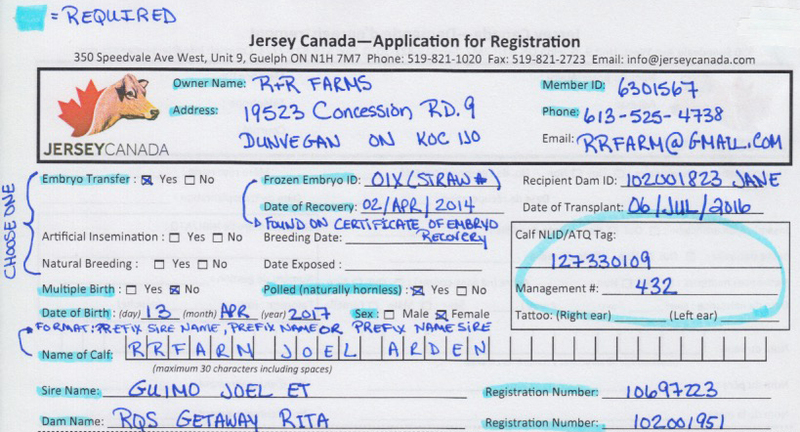 Frozen Embryo ID Write the embryo number if the calf is the result of an embryo transfer (this is the embryo number assigned by Jersey Canada at the time that the flush was registered and can be found on the Jersey Canada Embryo Ownership Certificate or Embryo Flush Report). Recipient Dam ID Indicate the registration number, management number or name of the recipient dam, if the calf is the result of an embryo transfer. Date of Transplant Indicate the date that the embryo was implanted if the calf is a result of an embryo transfer. Artificial Insemination Check “Yes” if the calf is the result of artificial insemination breeding. Breeding Date Indicate the date the breeding took place if the calf is the result of artificial insemination. Natural Breeding Check “Yes” if the calf is the result of a natural breeding. Date Exposed Indicate the date the dam was exposed to the sire of the calf if the calf is the result of a natural breeding. Multiple Birth Check “Yes” if the calf is a twin. Check “No” if the calf is a single. Polled (naturally hornless) Check “Yes” if the calf is genetically polled (naturally hornless) or “No” if it is horned. A small percentage of Jerseys are naturally hornless and never grow horns; this is indicated by a “-P” at the end of the registered name. Date of Birth Indicate the day, month and year that the calf was born. Calf NLID/ATQ Tag Indicate the long tag number that has been assigned to the calf. The number will be 7 digits long for NLID tags or 9 digits long for ATQ tags. You may attach the appropriate sticker in this box if you prefer. Management # Indicate the management number corresponding to the NLID/ATQ tag assigned to the calf. * This is optional. Tattoo (Right ear) If the calf is tattooed, indicate the numbers and/or letters which appear in the calf’s right ear. Tattoo (Left ear) If the calf is tattooed, indicate the numbers and/or letters which appear in the calf’s left ear. Name of Calf In the maximum of 30 spaces write the name of the calf being registered starting with the prefix of the breeder. Usually the name (or short form) of the sire's name appears next. Finally, the name of the calf is written in. Note: Blank spaces, “ET” suffixes, and “-P” suffixes all count in the 30 characters allowed. Sire Name Write the full name of the sire of the calf being registered. Registration Number (sire) Write the registration number of the sire of the calf being registered (usually 6-8 digits, and found on the breeding slip). Dam Name Write the full name of the dam of the calf being registered. Registration Number (dam) Write the registration number of the dam of the calf being registered. Fax the form to Jersey Canada and keep the original. Click here for a step-by-step VISUAL guide just for you! Your "Member I.D." is your Jersey Canada account number. To obtain a password for your online account, contact the registrar at info@jerseycanada.com or (519) 821-1020 (ext. 101). Please allow one day for password activation. From the Jersey Canada homepage there are two ways to access the on-line registration portal. You can click on the “Online Registration” quick link or alternatively, you can click the “Login/Register” text (top right of home page underneath SEARCH field). Once you have entered the member portal, it’s always a good idea to bookmark it for quick future DIRECT access. At the "Signon" screen, enter your "Member I.D." and the assigned password. It will prompt you for a NEW password. Please verify your new password and record it for future reference. If you forget your password, contact the Jersey Canada Registrar. Click the "Signon" button and you are now logged into the Jersey Canada registration portal. Proceed to online registrations. Click "Online Transactions" at the top of your screen (on right). On the batch screen, all your batches will be listed as “initialized”, “validated” (not submitted) or “submitted”. To start a new batch of registrations, click "Create a New Batch" (center of screen). If there are any special requests/notations to be made, enter them in the comments section (i.e. premature calf, late born calf, possible freemartin, special ownership instructions, pedigree request, parentage verification). Once comments are completed, click "Create" to proceed. On the next screen, click “Add" for the registration form. Enter the information as indicated on the form. If you are registering an ET calf, enter the date of implantation as the AI/Mating date. When entering dates, use this format (dd/mm/yyyy). Include straw/embryo number for embryo implants (found on implantation certificate). Enter the Dam and Sire registration number in the "Dam ID" and "Sire ID" boxes (i.e. 10013706) - do not include spaces. The animal name will appear if the number is entered correctly. For animals not registered you can use JEUNKNDAM (for the Dam), JEUNKNSIRE (for the Sire) or XXUNKNSIRE (if NOT Jersey). For animals that are not in the Canadian database, but have registration numbers, enter the registration number and animal name in the comments section. After completing the registration application, select an option at the bottom of the form. Use the "Validate and re-display form” and if any errors/warnings exist they will be highlighted. Please go back, check the information and repeat step 2. Then click "GO". If you would like to delete an application and start over, select "Delete this record" and click "GO" to next record. Once your application is verified (with no errors), your batch listing will be displayed. If you need to change the information on an application, click “Edit” to go back to the application window to make the changes. To continue with more registrations, click "Add" and repeat steps 1-4 above. Once registrations have been completed, click "View Batch Summary and Batch Submission Screen" for the records (top center). A summary your submitted registrations will be displayed. If you would like to add more comments, click "Edit Comments" in the "Batch Options" section, then "Update". Once you are satisfied with the registrations, click "Submit this batch to Jersey Canada" (Batch Options). The next screen will indicate if your registrations were successfully submitted. To view the batches, click "List All My Batches". To create a new batch of registrations, start the process over from Section 2 above. When you have completed your registrations if you log-out of the portal or leave the online transaction section, you will be asked to sign back in.